Background: In August 2009 I had to pick a subject for a research paper for a course entitled Current Topics in Space Science at Embry-Riddle Aeronautical University in Daytona Beach, Florida. My father, Barry S. Roffman, suggested that I look into the question of how dust devils could form on Mars where the pressure was believed to be quite low, about 6.1 mbar at areoid, the Martian equivalent of sea level. My paper was entitled Enigma of the Martian Atmosphere: Higher than Advertised Martian Air pressure? I was first invited to continue my study under the guidance of Dr. Michael Hickey in a special topics course at Embry-Riddle, and then asked to present my findings to the 13th International Mars Society Convention in Dayton, Ohio on August 5, 2010. At the conference, one of the first questions asked was about how my findings were viewed by Professor Emertus James E. Tillman (Director of the Viking Computer Facility at the University of Washington). It became apparent that the basis of nearly all current beliefs about Martian atmospheric pressure can be closely linked to the data found on Professor Tillman's VIKING PROJECT web site at http://www-k12.atmos.washington.edu/k12/resources/mars_data-information/data.html. While we were in contact with each other until 2012, we do not yet agree on the interpretation of his data. We believe there is ample reason to conclude that the pressure fluctuations found on the Viking project site are almost entirely, or entirely due to fluctuations in internal Viking operating cycles, with emphasis on the Radioisotope Thermoelectric Generator (RTG) heaters employed. Why Internal Operating Cycles Were Measured - The Roffman Assertion. Viking 1 and 2 pressure sensors were (like Phoenix and MSL Vaisala transducers) disabled by clogged dust filters immediately before, during or right after their landings on Mars. Specifically, dust was trapped in the quarter-inch diameter tube leading to the Tavis pressure transducer. These tubes were even smaller on PathFinder, Phoenix and MSL and there was no way to change the dust filter in the access tube on any of these missions. As air was sucked in, enough dust (and perhaps even sand in the last seconds of the landing) entered to clog the filter while the pressure was still very low (under 10 mbar). Air trapped on the internal side of the clot became all the air that the transducers could feel or measure. Before exploring all the data to support this assertion, please examine Figure 1 below which shows the dust, sand, and rocks kicked up upon the landing on Viking 1. A similar occurrence likely happened on the Pathfinder (which also used a Tavis transducer) and again with Phoenix and MSL. In fact, a photo shown here taken at MSL Curiosity supports this assertion. The Vaisala pressure sensor of Phoenix and MSL and its dust filter are shown on Figure 2. Figure 2 below: Vaisala Barocap Pressure Transducer used on Phoenix. and MSL. Figure 1 above was the first photograph ever taken on the surface of Mars. The MARS book by Kieffer et al. (1992) states of this photo on page 106 that, "The Viking 1 Lander camera began scanning the scene from left to right 25 seconds after landing and continued for 5 minutes. The picture was displayed to an amazed and excited audience in real time as it was received at the Space Flight Operations Facility at JPL. The dark band near the left was caused by the dust cloud stirred up by the landing as it drifted downwind and momentarily came between the Lander and the Sun (Viking P-17053)." Text accompanying the on-line photo is as follows: "The image above is the first photograph ever taken from the surface of Mars. It was taken by the Viking 1 lander shortly after it touched down on Mars on July 20, 1976. Part of footpad #2 can be seen in the lower right corner, with sand and dust in the center of it, probably deposited during landing. The next day, color photographs were also taken on the Martian surface. The primary objectives of the Viking missions, which was composed of two spacecraft, were to obtain high-resolution images of the Martian surface, characterize the structure and composition of the atmosphere and surface, and search for evidence of life on Mars. Date: 07/20/1976 NASA Center: Jet Propulsion Laboratory. Figure 1 makes clear that there was more than enough dust, sand, and debris kicked up on the landing to clog the dust filter and its access tube. EFFECTS OF THE DUST STIRRED UP. If transducer pressure access tubes were blocked by dust and/or sand, then all the transducers could feel behind the blockage would only the pressure on the partially air-filled transducer. The blockage would prevent the transducers from sensing the actual ambient pressure. Changes to the pressure exerted and measured internal to the blockage would be due to heating caused by internal operating electronic equipment and in particular it would be due to heating by Radioisotope Thermoelectric Generator (RTG) heaters on board. In an effort to confirm this, the first thing sought was a consistent temperature spike at a set time. With an automated requirement to turn on the heat, pressure would grow at the time of heating of the trapped air. When the order came to turn off the heat, pressure would decline. It was expected that the pressure pattern would thus resemble the inverse of the temperature in the ambient air, as the heater could be expected to come on to heat the internal environment most when the outside was reaching its coldest time of day or season (winter). A pressure rise was seen for much of the Martian year (especially late summer to early winter) in the time-bin ("hour") between 0.26 and 0.3 each morning (the Martian equivalent of 6:24 AM to 7:23 AM). In the time-bin 0.3 and 0.34 sols in the next hour each morning (7:23 AM to 8:22 AM) the pressures grew little more, stopped, or began to fall. The Viking Project data is based on 25 time-bins (like hours) with about 59 minutes in each. It was expected that this optimal heating time might shift by a time-bin as sunrise moved later or earlier into the year depending on the season. This was also seen. Sometimes the biggest pressure rise of the day was at the .22 to .026 time-bin, and at other times the biggest shift was later in the 0.3 to .34 time bin, or even the following one. However, once the shift was seen, it tended to stay set for many weeks. Table 1A shows the average pressure for six studies encompassing Viking 1's sols 1 through 350 (summer to winter). Table 1B shows the average pressure for four studies encompassing Viking 2's sols 156 through 290 (early fall to winter). Table 2 has links to the specific data and graphs for pressure changes in each study. Winter (last 2 rows combined). Note: This study includes increased cooling rather than warming in the 0.3 to 0.34 time-bins on 12 sols. As the heater is needed more, pressures increase more durings sols 329 to 361 in the later time-bin than in the earlier 0.26 to 0.3 time bin. Pressure increases seen in the 0.26 to 0.30 sol time frame were generally many times greater than pressure drops associated with dust devils. This data, if accepted, means that all previous conclusions by NASA about pressure with respect to Martian weather are incorrect. Problems with the Pathfinder and Phoenix sensors are discussed in my earlier paper (see Section 2.4, Issues Raised by the Finnish Meteorological Institute (FMI) in the link at Part 3 of CRITIQUE OF NASA'S MARTIAN WEATHER DATA WITH EMPHASIS ON PRESSURE. Figure 3 - PRESSURE CHANGES RECORDED BY VIKING 1 OVER ITS SOLS 200 TO 350 (Daily time-bins 0.26 to 0.3 and 0.3 to 0.34). For links to graphs for Viking 1 sols 1 to 116 and 134 to 199 see Table 2 below. 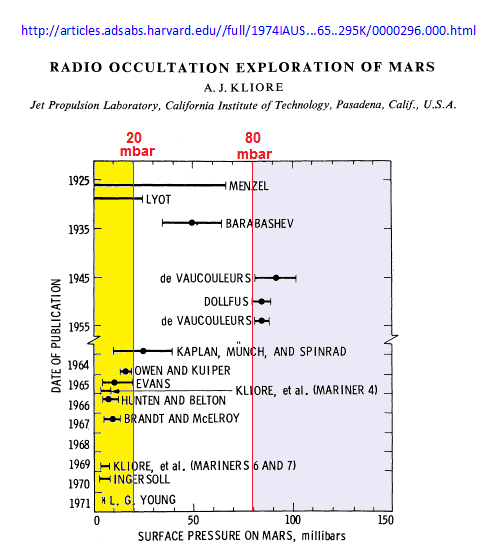 NOTE: All this Viking 2 data is also found in ANNEX B of the Roffman Mars Report. New problems cause inability to report any pressure changes from hour to hour over much or most of this period. Temperatures at times reported as Absolute Zero (impossible). The three graphs shown as Figures 5A, 5B, and 5C below are derived in part (5B) or all (5A and 5C) from the Tillman and Johnson graphs shown on page 842 of the book entitled MARS (1992) by editors Kieffer, Jakosky, Snyder and Matthews. It is believed that when temperatures fall or stay cold outside the Vikings, RTGs will generate more heat to keep things inside the lander "cozy," a term that Professor Tillman used to describe temperature inside. He asserted that an astronaut in a pressure suit would be comfortable there. The exact definition of "cozy" is not yet known; but let us assume that it is 20 degrees Celsius (293.15 K). Now, suppose the starting pressure is 8 mbar. If the air in a transducer behind a clog due to dust were simply allowed to cool by 10 K, pressure there would drop to 7.7274 mbar. But if an RTG kicked on to raise the temperature by 10 K at the transducer, then pressure there would rise to 8.2729 mbar. When the heater turned off and allowed temperatures to start falling again at the transducer, we would expect to see the pressure start to fall again. This is a pattern often seen at the Vikings. ZEROING IN ON THE TRANSDUCER RELIABILITY KILL. (1) Winter Temperatures and Pressures. First we must look at Figure 5C above,. 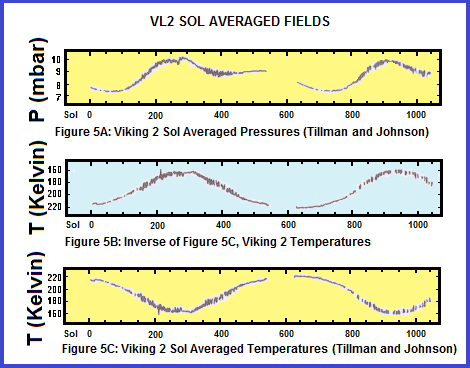 It indicates Sol-averaged temperatures for Viking 2. It shows a minimum (coldest) temperature average in the vicinity of 160 K. I looked through the data provided by Professor Tillman and found two such days, with the coldest being on Viking 2 Sol 310 when the temperature averaged 162.4828 K. I also went through the 25 time bins on Viking 2 Sol 292 and found an average temperature then of 165.288 K. The pressure was slightly higher on Sol 292. In fact, it was the highest average for a day that I saw, but I did not check every single day around it yet. The average pressure on Sol 292 was 10.1228 mbar (for Sol 310 it was 9.8432 mbar). While this article focuses on the Vikings, the MSL Curiosity registered an 11.49 mbar pressure on its Sol 370 that essentially pegged out to at the maximum value that it could reecord. This suggests that the actual pressure was much higher for part of that day. It may also reflect what might have happened when a dust clot on its Vaisala sensor was knocked out while the rover drove over rocks. (2) Summer Temperatures and Pressures. The warmest day found seemed to be around Viking 2 Sol 640. Then the temperature averaged 221.0836 K. The pressure for that day averaged 8.046 mbar. Another warm day checked (Sol 740) had an average temperature of 212.176 K. That day had a lower pressure average - just 7.402 mbar. A third warm day was seen at Viking 2 Sol 71 when the temperature averaged 211.8768 K and the pressure was 7.4532 mbar. (3) Checking the Extremes for the Vikings. While not matching the dates exactly, the coldest temperature seen in Viking 2's Year 1 was 159.48 K. on VL2 sol 211 (winter). The warmest day in Year 1 was 219.7428 K on Viking 2's sol 20 (summer). The lowest average pressure was 7.3892 mbar on Viking 2's sol 56 (summer). As can be seen in the figure below, when I entered those figure into an on-line pressure temperature calculator, the highest pressure predicted for a closed container (LIKE AN AREA CAUGHT BEHIND A DUST CLOT AT THE DUST FILTER) was 10.181 mbar. The highest average seen was very close at 10.196 mbar on Viking 2's sol 285 (winter). The pressure difference is only 0. 015 mbar. The data for Viking 2's Year 1 can be summarized as follows on Table 3A. 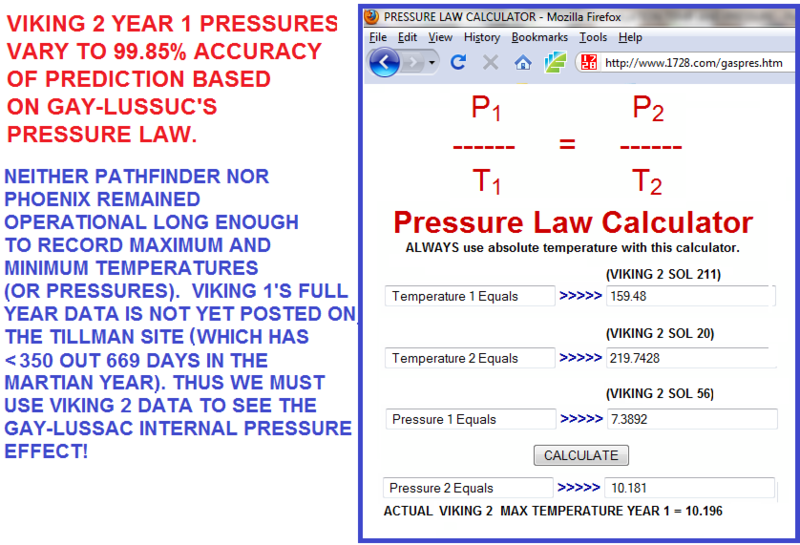 Figure 6: Calculator with Maximum and Minimum Temperatures plus Miniumum Pressure for Viking 2's Year ONE shows the maximum possible pressure in accordance with Gay-Lussac's Pressure Law. For an on-line calculator that allows you to see how pressures vary with absolute Temperature, see Gay-Lussac Calculator by Software Systems. Using it, we see that the predicted pressure range based on a dust clot is certainly there before we start looking at issues like weather fronts, dust storms, and eccentricity or differences between sublimation rates at the poles of Mars. There was, however, a global dust storm in progress when the highest pressure (10.1228 mbar) and coldest temperatures (159.48 K) just note were recorded. Dust storms keep temperatures from dropping as far as they might at night, or rising as much as they might during the day. It got warmer on Viking 2's Year 2, reaching an average daily temperature of 246.48 K on Sol 725. However from the data and the number of times when pressure or temperature is missing, it appears that there was major degradation in reporting ability from what was seen with Year 1 for this lander. Data for Year 2 is summarized in Table 3B. This data is especially suspect because of the many times that the pressure indication appeared to be stuck at the same exact figure with no sign of the normal daily pressure fluctuations. For example, the minimum pressure seen and noted on Table 3B was 7.38 mbar. However this pressure reading held steady from Viking 2 sol 735.74 through sol 737.26. That's a day and half of no pressure changes noted, not even a hundredth of a millibar. In fact, it was stuck at 7.38 mbar for at least 10 consecutive time-bins repeatedly for at least 283 time-bins (each about 59 minutes long) during Viking 2 sols 713 to 751 (between Ls 139.451 and Ls 159.886. From Viking 2 sols 700.5 to 706.46 the pressure gauge was stuck at 7.47 mbar with no diurnal fluctuations at all. That is 6 days with no variation what-so-ever. The data for sols 600 through 799 was found on Professor Tillman's Viking Project site at http://www-k12.atmos.washington.edu/k12/mars/data/vl2/part4.html. The data for Viking 2 sols 800 to 999 is taken from the Viking Project site at http://www-k12.atmos.washington.edu/k12/mars/data/vl2/part5.html. Excel spreadsheets will be posted here in the near future to support the finding that (lack of pressure) variations shown for Year 2 are not consistent with VL2 Year 1. They have a very synthetic look to them. Using Gay-Lussac's law and the 7.38 mbar minimum pressure noted on Table 3B along with the minimum temperature of 156.1 K and the maximum of 246.48 K, a maximum daily average pressure for Viking Year 2 would be expected to be about 11.653 mbar rather than the 10.24 mbar found, but since there was no pressure variation seen at the time of the minimum pressure found, it was not expected that the prediction for Year 2 would be as good as for Year 1 when there were consistent diurnal pressure change. Even so, if I just looked at Year 2 it had an 88.24% agreement with the prediction based on a clogged dust filter (for Year 1 is was a 99.85% agreement). However, the calculation here was hurt by greatly disorted data because the pressures were stuck on 7.38 mbar from time-bins 725.62 until 726.06 while the temperatures varied from the war, spot of 246.48 K at sol 725.62 down to only 192.13 K at sol 726.06. This variation by 54.35 K with no reported pressure variation is another example of why the Viking pressures are just not credible. Until MSL to see the Gay-Lussac limitation in effect, we could only use Viking 2 because neither Pathfinder nor Phoenix spent anywhere near a Martian year in operation. However the same patternswere visible again with MSL which at the time of this update had 462 sols on Mars. We need 3 out of 4 points to use Gay-Lussac's Law and then we calculate the 4th point. With Viking 1, the Viking Project site does not yet include the hourly information, or daily information, beyond its sols 1 to 350, with sols 117 to 133 missing. Alleged Accuracy of the Tavis Viking Pressure Transducers. The MARS book (Kieffer et al. 1992) recommended by Professor Tillman states on page 839 that Viking surface pressure measurements “were limited by digitization to ≈ 0.08 mbar, or 8 Pa.” What does this mean? I think Professor Tillman mentioned something about 256-bit transmission. If the sensor had a range of 0 to 18 mbar, then 18/256 equals .0703 mbar per bit. If the transducer could only spit out .07 or .08 increments of pressure, then those beautiful pressure curves that we see are not so beautiful. Professor Tillman's data includes the following caveat on each file:These rows of data are formed by checking for bad data, removing or reprocessing them, collecting the points into one of 25 equal length intervals, "bins", in each sol, and then averaging each bin. When no data exist in one to a few bins, a value is interpolated, (using a cubic spline technique, which is not described here). All of this may mean that on days where his data indicates very small pressure changes, they may be inferred, but not real, or on days that pressure did not change, there were pressure changes that did not meet levels that would be reported due to limitations due to digitization. In an attempt to see what was really going on, Annex C of our Mars Correct Report was constructed to show exactly how often the pressure readings were stuck between Viking 2 sols 639 and 799. One of the first things noticed (on the 54-page link just given) due to the absence of any normal diurnal pressure cycle was that it is much more than one or a few bins where data were artificially inserted. The greatest example of this was between Viking-2 sols 700.5 to 706.46. For 150 consecutive time-bins, the pressure reported never varied from 7.47 mbar, this despite a high temperature of -24.6 °C (248.55 K) and a low of -83.17 °C (189.98K). A detailed analysis at the link just provided shows that over 141 sols, on at least 72 instances there was consecutive bouts of no pressure data at all, or at least 10 consecutive times bins when there was no variation in pressure from one bin to the next. In 34 cases, the needle got stuck for at least 10 consecutive time-bins at the beginning of .86 time-bin (which corresponds to about 9:10 PM local time). This is just one more indication that the pressure transponder had to be reacting to internal events aboard Viking 2 rather than ambient pressures outside the lander. Mariner 69's occultation experiment indicated that the atmospheric pressure at the surface of Mars ranged from 4 to 20 millibars, rather than 80 millibars as estimated earlier. This information had a definite impact on the aerodynamic shape of the Mars entry vehicle being designed, since weight and diameter would influence the craft's braking ability. Langley engineers had determined that aerodynamic braking was the only practical method for slowing down a lander as large as Viking for a soft touchdown. The entry vehicle would have a diameter of 3.5 meters, an acceptable ballistic coefficient that would help ensure Viking's safe landing on Mars. It appears that by Mariner 69's, the article is referring to the Mariner 6 and 7 flyby spacecraft that had their closest approaches to Mars on July 31, 1969 and August 5, 1969. But their NASA-advertised radio occultation pressures for Mars were only 3.8 to 7.0 mbar. The 20 mbar figure is almost 3 times higher. And what are we to make about the 80 mbar figure that is refuted with the 20 mbar estimate? Mariner 4 had flow by Mars on July 14, 1965. Its estimate of pressure on Mars was pegged at 4.1 to 7 mbar. The NASA source for these lower pressures is found at http://nssdc.gsfc.nasa.gov/planetary/mars/mariner.html. See the results section under each Mariner mission. However, if NASA had the 20 mbar figure, and was publishing it too, again, the question must be asked, why in the world would it select pressure transducers for the Vikings that could only measure up to 18 mbar? As can be seen with Figure 7 below, there were pressure estimates of 20 mbar in 1965 (Evans), but after the Mariner 6 and 7 the issue was supposed to be settled with a maximum pressure at 7 mbar. Why was a detailed NASA document written in 1978 still putting forward the 20 mbar figure? Perhaps someone realized what is abundandly apparent on my study. The Viking pressure data is fatally flawed. Further, without a fix for dust ingestion by Pathfinder and Phoenix, they were also fatally flawed. We must plan on the pressures seen by studies in 1965 or earlier. The MSL flew with the same mistakes made again. Based on the facts that that its pressure pegged out at maximum value on is sol 370, and the fact that the REMS Team actually originally reported pressures between 742 and 747 mbar (hPa) between September 1 and September 5, 2013 before revising them dwon by a factor of 100, there is reason to doubt all MSL pressure credibility. More, based on cumulostatus clouds seen 16 km above Pathfinder (13 km above areoid) it is actually possible to estimate a pressure at areoid of 510 mbar. See the data here. MAGNITUDE OF PRESSURE RISES DURING THE VIKING TIME-BINS STUDIED. Pressure spikes for Viking 1 range up to an increase of as large as 0.62 mbar during sol fragment 0.26 to 0.30 (see data for Viking 1 Sol 332.3 at Ls 286.576) . An increase of 0.62 mbar in 59 minutes is equal to an increase in pressure that is over 10% of the 6.1 mbar pressure generally accepted as the average pressure at areoid on Mars! The average daily pressure increase from Sol 200 to 350 sol was about 0.2154 mbar. It was taken from four time periods corresponding to early fall (20 sols during Ls 201.859 to Ls 213.736), fall (85 sols during Ls 214.316 to 268.687), late fall to early winter (30 days during Ls 269.292 to Ls 287.862) and 16 days of winter during Ls 288.441 to 297.84. During these periods for 151 sols consecutive sols there was one day single pressure drop (Sol 240.3) and no steady pressure during in the 0.26 to 0.30 time-bins. Pressure increased 148 times However, the 0.30 to 0.34 time-bins showed 36 occurrences where pressure did not change at all from the 0.26 to 0.30 time-bin, and there were 28 pressure drops in this time-bin. There were 87 pressure increases in the 0.30 to 0.34 time-bin. The 0.30 to 0.34 time-bin showed variation that should be expected with a weather pattern that naturally varies. The fact that there were almost no such variation in the 0.26 to 0.30 time -bin is evidence that the pressure transducers were being affected only by events ordered by an internal clock mechanism. The graphs on Figure 3 represent a little over 20% of the 669-sol Martian year. DATA FOR THE SUMMER TO FALL PERIOD. Viking 1 Sols 150 to 199 were during the late summer to early fall (Ls 172.312 TO 201.294). Click HERE for the data for these 50 days. During this interval the pressure rose in all 50 Martian days, but it again rose by more in the 0.26 to 0.3 time-bin (average rise 0.1332 mbar) than in the 0.3 to 0.34 time-bin (average increase just 0.0508 mbar). The pattern of increased pressure is much stronger late in the summer as is apparent in chart showing pressures for Viking 1 between its sols 1 to 116 and 134 and 199 (data sols 116 to 133 is not yet available on Professor Tillman's site). The first chart starts at Ls 97.343 (the first day of summer is Ls 90) and goes through Ls 153.675, then the next chart resumes at Ls 163.359 and through and past the first day of fall (Ls 180) finishing at Ls 201.294. In the segment that runs from Ls 97.343 through Ls 153.675 (all summer) the average pressure increase in the 0.26 to 0.3 sol time-bin was only 0.023276 mbar). It was less in the 0.3 to 0.34 time-bin (0.010431 mbar). The difference here is not significant, however, in the same time-bins for Ls 163.359 through Ls 201.294, we see an increase of 0.1224 mbar in the 0.26 to 0.3 sol slot, and only 0.0459 mbar in the 0.3 to 0.34 time-bin. The earlier "hour" has a pressure increase 2.67 times greater than the later time-bin. In looking over the temperatures outside of Viking 1 during the periods covered in the last paragraph, I was struck by how little temperatures changed in the 0.22 to 0.26 time-bin, in the hour before the time that I primarily focused on (0.26 to 0.34) each sol. For example, between sols 1 to 116, on 75 out of 116 Martian days, the outside temperature was between -84.01 º and -85.99 º C. These 75 days between Ls 97.343 through Ls 153.675 equate to about 64.65% of the days in question. During these days, by the 0.34 time bin, temperatures rose to as much as -39.22º (on Viking 1 Sol 114.34 at Ls 152.611). The average temperature at the 0.34 sol time-bin was -53.265º C (see Morning Temperatures on Mars). Note, the summer solstice at Ls 90 is not the day where the sun is highest in the sky at Local Apparent Noon for Viking 1. This is because Viking 1 landed in the "tropics" of Mars at latitude 22.48 º degrees North. The vertical rays of the sun at solstice are at latitude 25.19º degrees North. As such, the vertical rays at the Viking site are experienced before and after solstice. In the early to mid summer it is not expected that the RTGs will heat the interior as often as in the fall or winter. This means that the pressure increase behind any dust clots will not be as great because the sun can be relied upon to provide more heat as the morning progresses. In the fall, less heat is provided by the sun, so more heating is required by the RTGs, thus providing much more pressure (and pressure increases) in the 0.26 to 0.3 time buckets (6:24 AM to 7:23 AM local Mars time) than in the 0.3 to 0.34 time-bin (7:23 AM to 8:22 AM local Mars time).